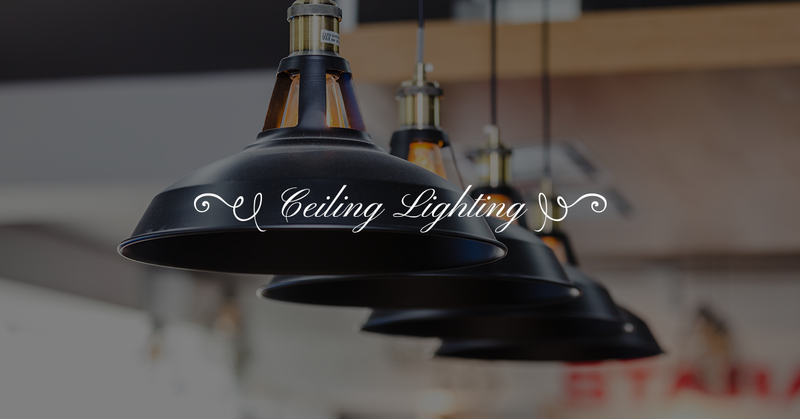 Give each room in your home the perfect finishing touch with ceiling lights from Lighting Concepts Showroom in Trussville. 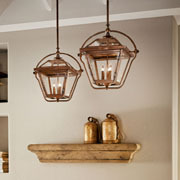 Our lighting showroom in Trussville has served the Birmingham Metro area for the last three decades. Our 8,500 sq. ft. showroom has every sort of ceiling light you could need to create the perfect lighting solutions for any commercial or residential area. All of our ceiling lights are specially designed to be installed from above, creating a unique overhead luminaire that provides efficient ambient and task lighting solutions for your home. A high-quality ceiling light can set the tone for an entire room, so whether you choose to make a bold statement or a minimalist design, the right fixture can help tell your room’s story. If you’re looking for a specific light fixture, or you just aren’t quite sure what would look best, drop by our lighting showroom to speak with one of our expert consultants. They have the product knowledge and the design sense to guide you to ceiling lighting solutions that will both illuminate and beautify any space. What Ceiling Lights Do You Carry at Your Store? 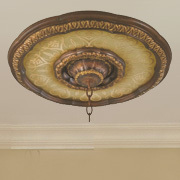 When it comes to lighting, there’s nothing more foundational or important as ceiling lighting. 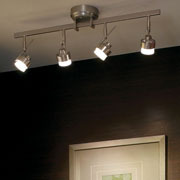 Your ceiling lights are most often the source of ambient lighting for your room. If you get your ambient lighting right, then everything else will fall into place. 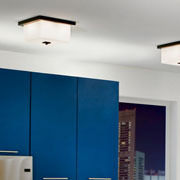 However, ceiling lighting is not just for providing ambient light. 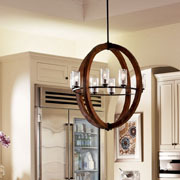 Ceiling lights can make excellent task or accent lighting as well. Because ceiling lights are such an important part of your lighting strategy, we make sure to keep our lighting showroom stocked with a wide range of types and styles for you to choose from. After all, every home, every business, every room will have slightly different lighting needs and design preferences. Each of these different types of lighting can serve several purposes. Often times the best way to light a particular space is to find a combination of multiple types of lighting. This will make sure you have both beauty and function for your space. 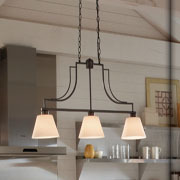 This will determine not only the size of a lighting fixture, but the type of lighting you choose. For example, a longer room might benefit from track lighting while a small room would suffice with a single overhead pendant. The ceiling height is particularly important to take into consideration. While a beautiful multi-pendant fixture might be tempting, a low ceiling would probably benefit more from a flush or semi-flush mount. 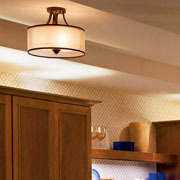 If you have a small room to light, then a single ceiling fixture will usually do. However, larger rooms such as a dining rooms might need ambient, accent, and task lighting features. You can also consider a dimmer for even more control. In the end, it’s your space to decorate. Whether you’re updating the lighting in your home or your responsible for coming up with new lighting for your business, make sure it looks good to you. Consider the atmosphere you want to create as well as the overall style of the building. 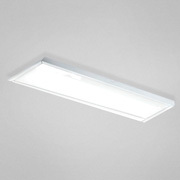 We’re proud to offer our Alabama customers some of the best lighting solutions available. Whether you’re shopping for a chandelier to hang in your dining room or you need decorative pendants installed in your kitchen, you’re sure to find the perfect lights at our lighting showroom. 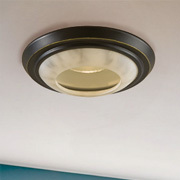 We also offer a unique array of flush mounts for your bathroom, track lighting for the movie room, and recessed lighting for your bedroom. 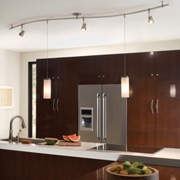 When it comes to your home’s light fixtures, you can count on Lighting Concepts Showroom to help. 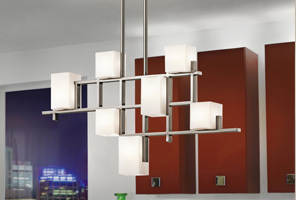 We have more than 29 years of experience in the lighting industry, and we’re dedicated to your complete satisfaction. Browse our lighting options online today and contact us if you have any questions about our fixtures. 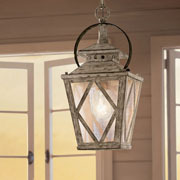 You can also drop by our Trussville lighting showroom to see our products in person and talk to one of our experts. We look forward to working with you!